1. Mix together the molasses sugar, tamarind paste, soya sauce, ginger, pepper sauce, garlic and lime juice to make a marinade. Put the chops into a shallow ovenproof dish and pour the marinade over them then turn the chops over so they get coated on all sides. Cover with clingfilm and put in the fridge for about an hour. Turn the chops during that time. 2. 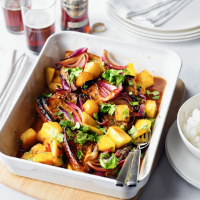 Tuck the pineapple, mango and onion wedges in around the chops, turning the fruit and onions over in the marinade so they get coated a little too. Bake in an oven preheated to 190˚C for 40–45 minutes. 3. Check the pork is thoroughlly cooked with no pink meat. Sprinkle on the coriander and serve with rice and a green salad.